How many of you have been invited to holiday potlucks and not know what to make? Or did you stress out over the idea of having to make something with the little free time you have? No worries my friends, this is an easy one. These amazing treats are the perfect recipe to have in your back pocket. Not only are these bites quick and easy, other potluck attendees will ohhh and ahhh over your mad baking skills. In a small bowl, stir key lime mix with whipped cream cheese. Chill in the fridge for 2 hours to allow the flavors to combine. Preheat your oven to 300. Place your phyllo shells on a baking sheet and place in the oven for 10-15 minutes – just until they start to brown. Remove and allow to cool for about 15 minutes. Spoon your key lime mixture into a zip top plastic bag. Zip the top and snip one of the end points to create a piping bag. If you have a piping bag or an icing pipe, you can use those as well. Pipe the pudding into each cup by creating a swirl like soft serve ice cream. 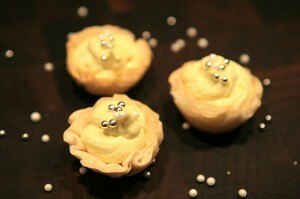 Place on serving platter and garnish with a few pearl candies.